Luis Carlos Galan was a Colombian journalist and popular Liberal Party presidential candidate who was killed in 1989 at the order of drug lord Pablo Escobar. An outspoken opponent of drug trafficking, Galan was in favor of forming an extradition treaty with the USA, and thus found himself a target of organized crime networks in Colombia. He declared himself the enemy of Pablo Escobar and Jose Gonzalo Rodriguez also known by the nickname “El Mexicano,” both leaders of the infamous Medellin cartel. After a number of death threats and thwarted planned attempts on his life, Galan was assassinated at a political rally in Soacha, Cundinamarca on the August 18, 1989 in front of thousands of spectators. With a political career spanning from 1970 until his death in 1989, he was a well-known Liberal politician who formed his own party Nuevo Liberalismo (New Liberalism) as offspring of the Liberal party, in 1979. Galan was born in Bucaramanga, Santander into a wealthy and well-connected Colombian family in September 1943. His father Mario Galan was a politician and was president of Ecopetrol for eleven years and his mothers family had links to former president Eduardo Santos and poet and politician Jorge Gaitan. His father moved the family to Bogota in 1949 and Galan began his studies in the Colegio Americano in 1950. Politically active from a young age, Galan reportedly attended a rally against Conservative president Laureano Gomez when he was only 8 years old. Galan attended Colegio Antonio Nariño for his secondary school education and was a high achiever in his academic studies. When Galan was 14 he participated in the 1957 student protests against the military regime of Gustavo Rojas Pinilla. During one of these protests he was hit in the face with a stone, leaving him with a distinctively shaped nose for the rest of his life. Although a minor and injured, he was arrested and held for more than a day for his part in the protest. Those close to Galan claimed this event sparked a determination to other-throw the military regime and fuel Galan’s political motivation. After completing his high school education in 1960 Galan enrolled in a degree in law and economics in Pontificia Universidad Javeriana in Bogota. In 1963 Galan founded the magazine Vertice, to express his liberal views in what was a predominantly Conservative university. During his first experience in journalism Galan came into contact with influential Colombian figures such as former Liberal president Carlos LLeras and El Tiempo owner and former Liberal president and godfather to his mother, Eduardo Santos. After graduating in August 1965 with a doctorate in law and economics, he was offered a job at El Tiempo by Eduardo Santos. While enjoying an extremely successful career as a journalist for El Tiempo, Galan began to develop his political career within the Colombia political world and more specifically the Liberal Party. Since his time at university Galan had spoken of a desire to modernize and revitalize the Liberal party. While still a student, but by this time a member of the Liberal party, Galan mobilized more than 2000 students in support of the campaign of presidential candidate Carlos Lleras Restrepo. This relationship with the Liberal president saw Galan rise rapidly in the Liberal party in the mid-sixties. Galan was first elected head of Economic society of friends of the country in 1966, and then as secretary to the Colombian delegation to the world conference of trade and development (UNCTAD) in New Dehli and in the Middle East. At the young age of 27, Galan was elected Minister of Education by President Misael Pastrana. His 2 year term as Minister of Education was marked by a number of notably progressive though arguably unsuccessful social policies. In 1972 Galan was appointed ambassador to Italy, and in 1974 while still serving as ambassador, he became the Colombian representative to the Food and agriculture organisation of the United Nations (FAO). During his time in Italy, Galan was also a representative at UNESCO meetings, chaired the delegation at the world food organisation and promoted Colombian-Italian cooperation in the formation of a National center for restoration of art works. Galan also initiated Colombian-Italian cooperation in rural development programs, brokered Italian and Mediterranean port deals and led to Italian involvement in tunnel construction in Colombia. After returning from Italy in 1976, Galan directed the Nueva Frontera weekly magazine which was founded by former liberal president Carlos Lleras. Galan was also a successful journalist for El Tiempo newspaper where he earned himself the position of the director’s assistant and later the membership of the Executive Directorate and wrote as a regular columnist for El Colombiano and Vanguardia Liberal. He published more than 300 editorial articles during his career. It was as part of his career as a journalist that Galan would first take a stand against the Narco-trafficking culture which he saw as poisoning Colombian culture and politics. Galan published an editorial in Nueva Frontera in 1977 denouncing the existence of Narco mafias and their influence on the political and social structure of Colombia. He also denounced what he saw as a corrupt political system in which money and exchanges with criminals were influencing politics. Galan saw these changes as being directly linked to the influx of money from drug trafficking, and described a moral crumbling and loss of social values in Colombian culture. In 1976, Galan ran for councilman in the town of Oiba in Santander. In 1979 he was elected senator for his native state of Santander. Since his student years, Galan had spoken of a need to revitalize the Liberal party. On the November 30, 1979, he started the Nuevo Liberalismo party, a faction of the Liberal party. Galan started the Nuevo Liberalismo party with Enrique Pardo Parra, Álvaro García Herrera and Rodrigo Lara Bonilla to combat what he saw as a crisis within not only the Liberal party, but Colombian politics as a whole. Cultural independence for the country and its specific regions with a focus on defending the rights of indigenous communities. The main aims were to involve the population more in politics, move away from social discrimination and political over-representation of the ruling elite, cleanse cronyism and corruption from politics and promote modernization of Colombian social and economic policy. Galan spoke of the need to revitalize the Liberal party, which he saw in recent years as failing to represent the people due to having spent too much time as a ruling party, and thus focusing too much on the needs of the ruling elite, and having become marred by increasing corruption and cronyism partly linked to rising crime and narco-trafficking in Colombia. Nuevo Liberalismo supported the formation of trade unions, grassroot organizations and various forms of popular participation in the formation of social democracy. The late seventies saw the development of Nuevo Liberalismo as a clear political entity and by 1980 Galan had left his career as a journalist to devote himself entirely to politics. Galan was elected councilman for Bogota in 1980 and in 1981 was named as an official presidential candidate for the Nuevo Liberalismo party in the upcoming year. In 1982 Galan ran for president and won 745,000 votes, but was defeated by conservative candidate Belisario Betancur. For Galan the campaign was positive despite his defeat, as his party had won 21 of the 23 department assemblies and he was re-elected as a senator after the election. However, he was criticized by members of the Liberal party for causing factions within the Liberal movement, and for his defeat by the Conservative Betancur. Support for Nuevo Liberalismo grew in the early eighties and saw positive election results in the 1984 elections. The movement, which participated in national elections until 1988, had six senators, nine representatives to the House, 27 members and 350 council members in the early and mid-eighties, however Galan decided not to run for the 1986 presidential elections so as not to incite further problems and deepen the divide within the Liberal party. Galan took time out of his political career to teach at the prestigious Oxford University in the U.K, and travel around Europe. During this time Colombia was embroiled in a period of extreme violence and insecurity linked to cartels such as the Medellin Cartel headed by Pablo Escobar. The late eighties witnessed an unprecedented level of well publicized bloodshed in Colombia. 1987 alone saw the assassination of many leading public figures such as Justice Minister Rodrigo Lara Bonilla, director of El Espectador Guillermo Cano and presidential candidate Jaime Pardo Leal, plus countless magistrates, judges, senators and journalists who dared to challenge drug cartels and promote an extradition treaty with the United States. In 1988 Galan made his return to Colombian politics after the Liberal Party convention in Cartagena that year voted for a referendum related to further demonstration of the party. On 6 July 1989, the united Liberal party put forward Galan as their presidential candidate for the 1990 elections. Galan was outspoken in his criticism of drug cartels, and put an initiation of an extradition treaty with the U.S.A and a total crack-down on organized crime as top priorities for his presidency. According to accounts the first assassination threats were calls made to Galan’s home telephone number after the Liberal Party convention to nominate an official candidate. Pamphlets were left in Galan´s mailbox which threatened to kill or kidnap his children if he ran for president. Ignoring the threats, Galan continued with his campaign which was a great success and he stood ahead of his competitors with more than 60 percent of votes in all polls. 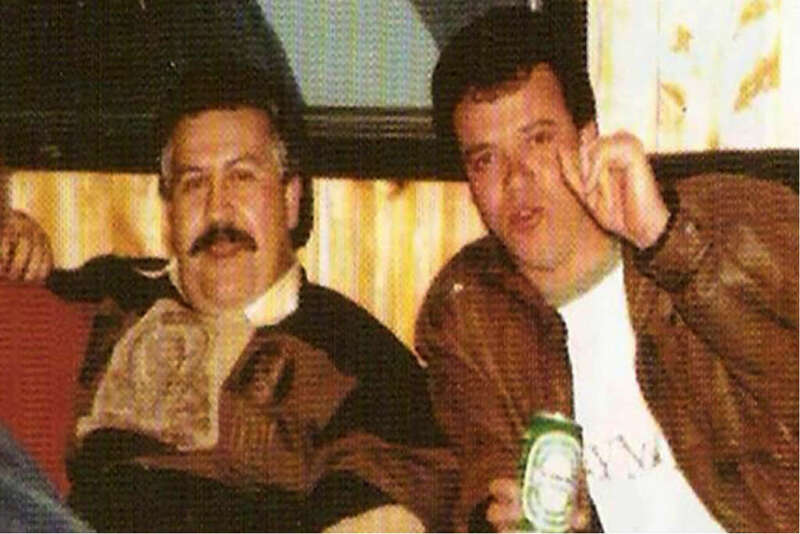 In a 1996 interview with La Semana, Pablo Escobar’s infamous hitman Jhon Jairo Velasquez, alias Popeye, admitted his complicity in the murder of Galan, following orders from the leaders of the Medellin Cartel, Escobar and José Gonzalo Rodríguez, alias El Mexicano. He claimed that Escobar and Rodriguez became increasingly concerned by the possibility of Galan being elected president, and the high chance of an extradition treaty being signed with the USA. After some deliberation, Popeye reported that he was given the go ahead to murder Galan. The first attempt was supposed to take place in Medellin, using a rocket launcher on 4 August 1989, but was foiled after a neighbor reported seeing men behaving suspiciously and informed the police. The second attempt on Galan´s life proved fatal. Galan´s security team had received a tip off that a team of assassins was headed to Bogota, and warned Galan against rallying in Soacha. Galan refused to change his schedule and attended the rally on the 18th August, where he was machine-gunned from an assassin in the crowd while walking onto the stage in a crime witnessed by around 10,000 people and later televised to millions of Colombians. According to his security team, Galan was still conscious after the shooting, but died on his way to hospital. At least 10 more were injured in the gunfire. 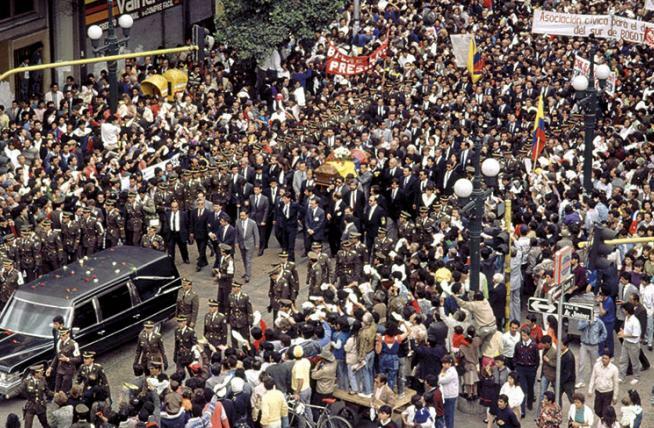 Galan was buried in the central cemetery of Bogota in a ceremony attended by hundreds of thousands of supporters. The aftermath of Galan´s death saw one of the bloodiest periods in recent Colombian history, with drug traffickers organizing a group known as Extraditables, who declared they would carry out indiscriminate killings of opponents of the drug trade and supporters of the extradition treaty. Two senior government officials were gunned down in the same week as Galan. Colonel Valdemar Franklin Quintero, the police chief of Antioquia was shot as he left his house in Medellin; and Appeals Court judge Carlos Ernesto Valencia Garcia was murdered within hours of issuing arrest warrants for Medellin cartel bosses Escobar and Rodriguez. In Bogota, 50 of 55 appeals court judges resigned on news of Valencia´s murder. Around Colombia 4,500 judges went on strike, warning they would quit if the government failed to provide better protection for them and their families. However, the cartels bloody attacks also led to a strong response by government forces and police, the arrest of thousands of cartel members and the re-instation of the US extradition law. Galan´s murder was said to be the last straw for many in power in Colombia, and the early nineties saw a bloody battle between government forces and drug lords, a closer bond between the United States of America and the Colombian government and the arrests and deaths of many key players including Pablo Escobar. The murder of such a prominent politician and public figure which was so obviously organized in direct response to his aims to tackle organized crime in Colombia showed the public and those in power that criminal elements in Colombian society had reached a level of influence and control that could not be allowed to continue.